The course for the first Vanderbilt Cup Race covered 30 miles of public roads in the center of Long Island including Jericho Turnpike from Queens to the hamlet of Jericho. 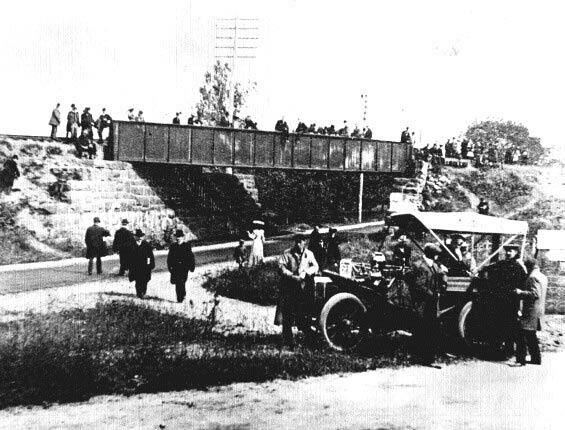 One of the best places to watch the 1904 race was the railroad bridge in Floral Park. This previously unpublished photo was taken from the Jericho Tunpike LIRR Bridge looking west. Tulip Avenue is on the left. William Luttgen can be seen driving the #18 FIAT. This is a view of the spectators on the bridge looking east. This is the exact same view seen 100 years later. I believe the bridge was taken down in the 1960s. That Creedmore Spur bridge was gone long before the 70s. But the embankment to the bridge remained as a steep hill crest on both sides of Jericho. It was leveled and spruced up in the late 60s. The spur is now a parking lot running from Jericho right to the fence of John Lewis School on Tyson. the cement silos midway up the spur are Floral Park landmarks. The long gone tracks of the spur continued to appear on some Hagstrum maps for years as a way for the map company to prove that someone had plagerized their map research. The bridge-hill is still rather pronounced on the north side of Jericho at Little Neck Parkway. Bummed I can’t go to your night with the Historical Sociaety in my town of FP. My brother Dennis should be there. version was probably removed in 1960-61 time period, when Jericho Turnpike was widened. I don’t think that’s correct. That 1871 built LIRR/Central bridge (the “stone bridge” as it was called on maps, at the juncture of Tulip Ave., Jericho Tpke./Jamaica Ave., and Little Neck Road (later Little Neck Parkway), was only lengthened in 1931/2, along with Jericho tpke/Jamaica ave. being widened and completely paved. It’s the same “new” bridge that was later taken down 40 or so years later. The original “stone” bridge (really a short trestle bridge supported on stone) was only lengthened once, not twice, as I recall. 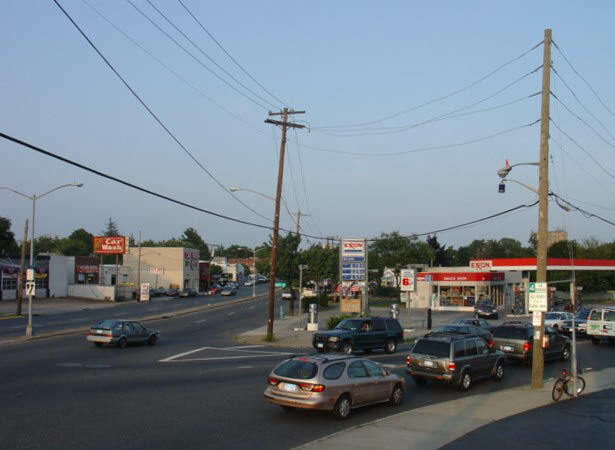 I own the last of the George/Ben Rhodes Little Neck Parkway homes at 87th ave. and Little neck Parkway, built in 1878, just a few blocks north of the intersection pictured. The other four Rhodes homes were taken down long ago to accomodate the laying out of the grid for the streets intersecting Little Neck Road, and it’s widening.